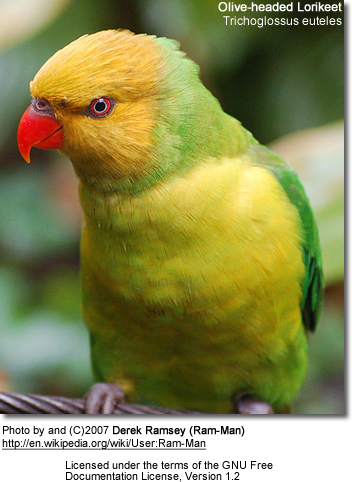 The Perfect Lorikeet (Trichoglossus euteles), also known as the Yellow-headed or Olive-headed Lorikeet, is endemic to Timor-Leste and the Lesser Sunda Islands from Lomblen east to Nila and Babar. It prefers subtropical or tropical moist lowland forest areas and subtropical or tropical moist montanes. This species is endangered in its natural habitat. As these birds are so rare in aviculture, they are expensive to acquire and only experienced breeders should attempt breeding them. It is best to place them into a well-managed breeding program. Adults average 9.75 inches (25 cm) in length and 2.8 - 3 oz (80 - 85 g) in weight. 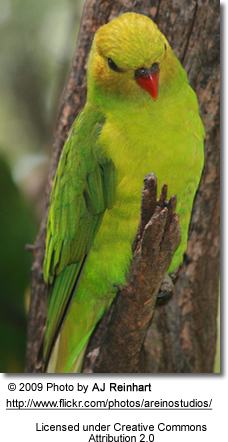 The adult plumage is generally green with an olive/yellow head. There is a pale green collar around neck. They have a yellow stripe under the wing. The bill is orange/red and the eyes are red. 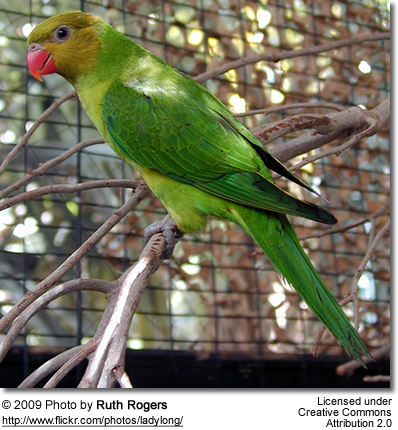 Juvenile birds have green / olive heads, lightly streaked with paler green. The bill and the eyes are brown. Due to their endangered status, any suitable specimen that cannot be released back into their natural habitat should preferably be placed into a well-managed breeding program to ensure the continued survival of this species.